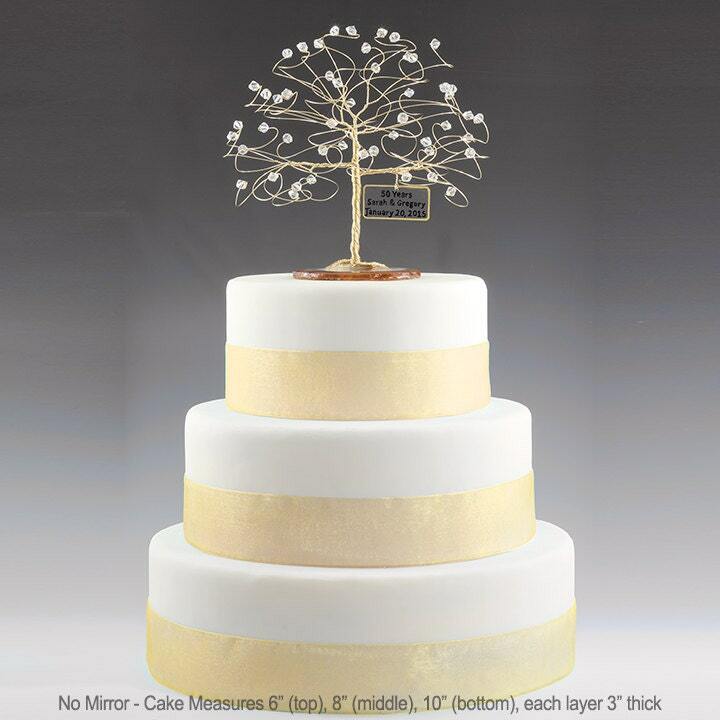 Personalized Wedding Anniversary Cake Topper Tree Gift Idea Custom Swarovski Crystal Elements on Silver Copper Gold Any Anniversary 6"
Personalized anniversary cake topper measuring 6" x 6". Great for any anniversary! Personalize with event date or wedding date, number of years, names, or any other text you prefer. Shown with clear swarovski crystal elements. Please see additional photos for bead selection image and read on for ordering instructions to create your custom tree sculpture! Select your choice of no mirror or mirror from the drop down box. Normal base is an agate slab, with the mirror the agate slab is attached to a 5" round mirror and dotted with matching crystals as fallen leaves. 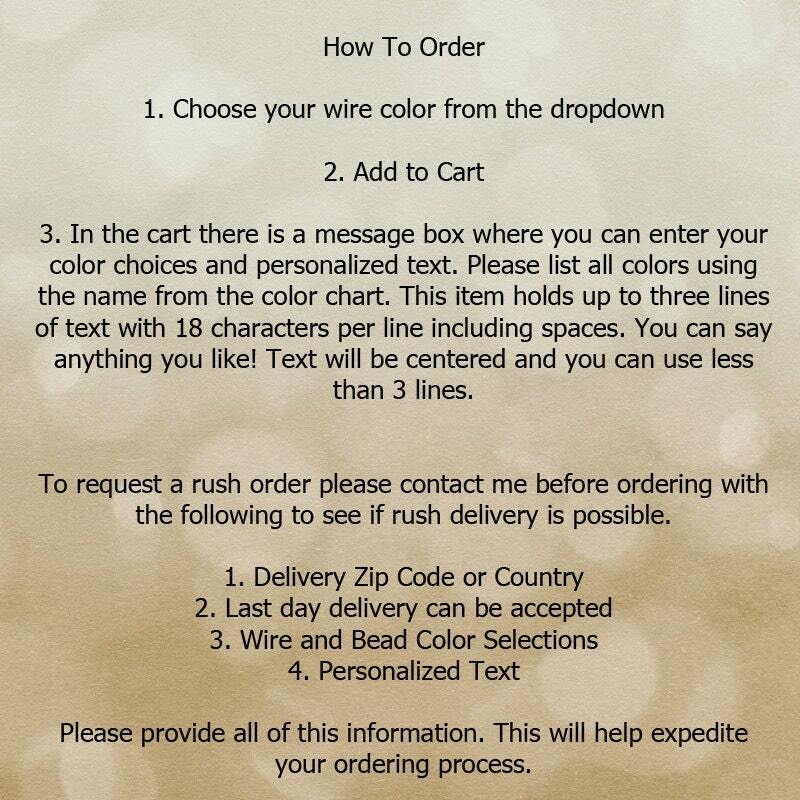 Select your choice of silver, copper, or gold tone wire from the drop down box. 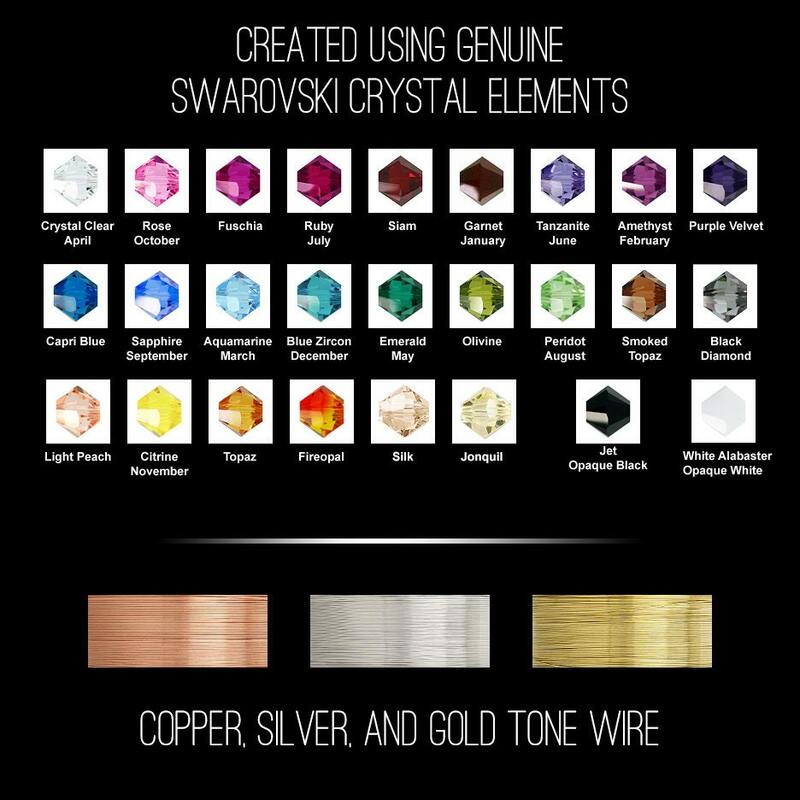 The bead color names from the bead sample image of all of the beads you would like used to create your tree. 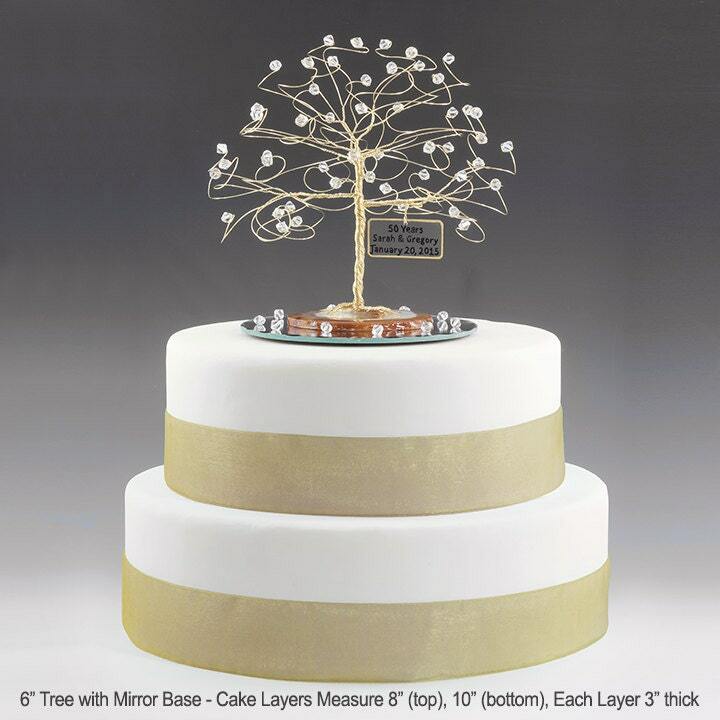 This tree measures approx 6" x 6" and is created from your choice of silver, copper, or gold non-tarnish wire. All 50 branches end in genuine swarovski crystal elements and the base is a slice of natural brazilian agate. Agate slab is chosen to compliment your wire and bead selections. Weight is about 4oz without the mirror and about 6oz with the mirror. Mirror is a 5" round attached under the agate slab and dotted with fallen leaf beads in your colors. The name sign is handmade out of clear acrylic. The text will be handwritten in black and the border will be silver or gold metallic to match your choice of wire. Print is on one side and can be seen through the back of the sign. Beautiful!! Looks better then the picture and the picture is beautiful! Shipped very quickly!! Spectacular! It’s delicate but not bland or boring. Beautiful. This is gorgeous! 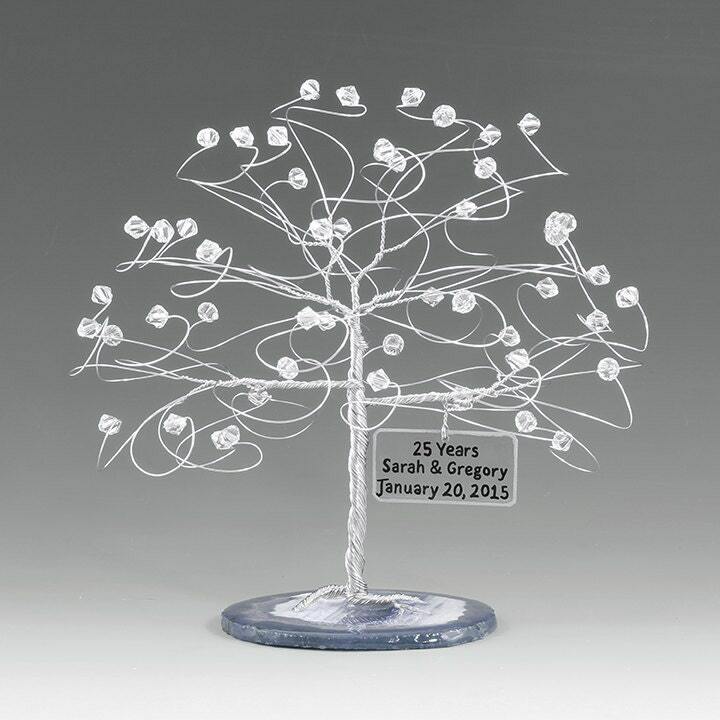 Cake topper for a 50th anniversary. Can't wait to use it. Artist was very nice and confirmed all details prior to creating it. This came very quickly and is very elegant. I know my in-laws are going to love it on top of their anniversary cake. We tried to do a surprise party but since that didn't work out...I have tried to add special details to the party that would provide them some surprise. They will love this one!